It’s now been quite some time since an iPhone last graced the peak of the PC & Tech Authority A-List. For almost two years Samsung’s and HTC’s handsets have dominated, with the 4S not doing much to further Apple’s cause. The iPhone 5 attempts to claw back that lost ground with a bigger, higher-resolution screen, an even slimmer profile, and further improvements to performance. That really is the big news with the iPhone 5, from a hardware perspective at least, and on the whole the changes are successful. As we’ve come to expect from Apple, it’s beautifully made, and the first thing that strikes you is its light weight. 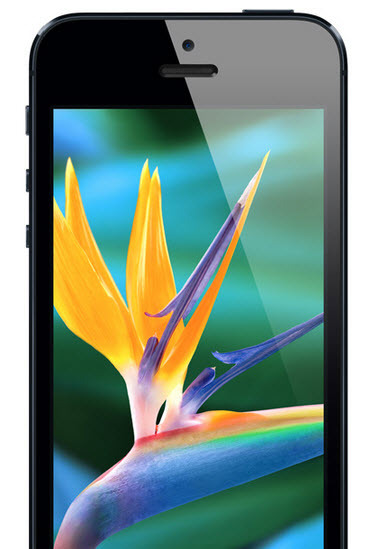 It weighs only 112g – lighter than the 4S by 28g, despite the extra height necessary to accommodate the larger 4in display. It also measures an astonishing 7.6mm thick. This is largely thanks to the loss of the rear glass panel, which is replaced by an aluminium chassis that feels cool and ever-so-slightly rough to the touch. We have one key reservation, though, and this concerns the new, so-called Lightning connector, which reduces the old 21.3mm-wide, 30-pin connector to a more compact 8-pin design that’s 11.6mm wide. There’s no speed benefit to this change for iPhone 5 owners – the current Lightning connector is still based on USB 2 – but it renders all your old iPhone accessories instantly absolete. Although adapter plugs are available from Apple, they’re a steep $35 a throw. Despite this, the iPhone remains technological jewellery of the finest sort, and the quality of the iPhone 5’s 4in Retina screen is beyond reproach. We measured its maximum brightness at 582cd/m2; deep dark blacks ensure an excellent contrast of 1058:1. Although taller, the 640 x 1136 display measures the same across as the 4 and 4S, which means the pixel density remains a gloriously high 326ppi. Whether the quality is better than the Samsung Galaxy S III’s is a matter of taste, with the Galaxy providing a slightly more saturated look than the iPhone 5’s more muted tones – but for our money, they’re neck and neck; it’s only the Galaxy S III’s extra size that keeps it out in front. 4-inch Retina display. It’s not just bigger. It’s just right. A key point to note here is the aspect ratio of the new display. After years of sticking doggedly to 4:3, Apple has at last gone widescreen. The new ratio is slightly broader than 16:9, which means you get the full widescreen movie experience with no letterboxing; existing apps will need to be updated to take full advantage, however, with black bars appearing at the top and bottom of the screen in apps not optimized for the iPhone 5. 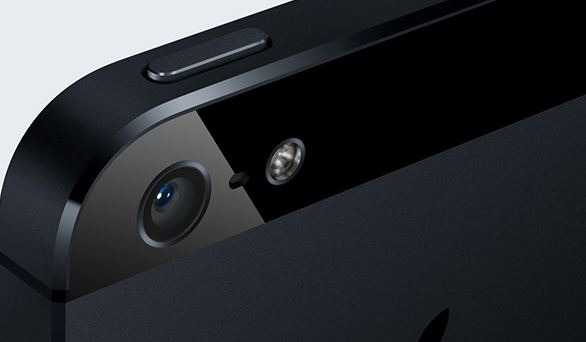 Only small improvements have been made to the iPhone 5’s rear camera. Apple has replaced the lens cover with a more scratch-resistant “sapphire crystal” version, and you can now snap stills while recording video, but the resolution for stills remains at 8 megapixels, as does the digitally stabilised 1080p video. The iPhone 5 (along with its predecessor the 4S) is still among the best in the business, though, and produces crisp, colourful snaps that are easily a match for those from the Samsung Galaxy S III. Surprisingly, Apple hasn’t added a burst mode, instead plumping for the introduction of a panorama feature. This allows you to capture broad landscapes with a sweep of the arm, and it’s commendably easy to use. The results are disappointing, though: you need a steady hand or pictures end up with distracting wobbles and kinks. The front camera receives a bigger upgrade, moving from 640 x 480 to 1280 x 960, with video capture increased to 720p at 24fps. The iPhone is often lambasted for its call quality, but our test calls made on the iPhone 5 were loud and clear at the other end, even if they lacked depth and richness. 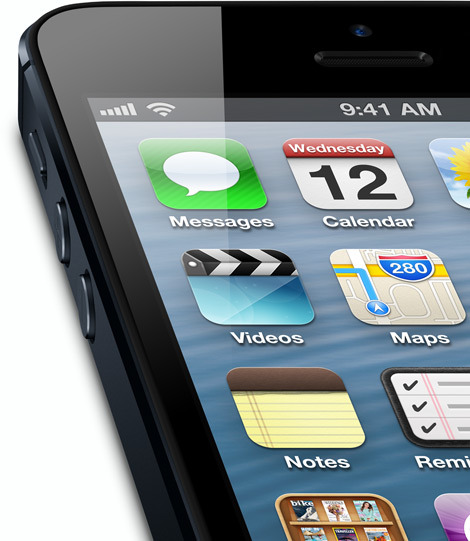 Much more impressive is the raw speed of the iPhone 5, which introduces the new Apple A6 mobile processor. Once again, Apple hasn’t run with the crowd here: the processor is a dual-core model, rather than quad-core, and it clocks in at between 800MHz and 1.2GHz depending on load, with 1GB of RAM to back it up. That may not sound very impressive, yet it was scorchingly fast throughout testing. In SunSpider, it pulled in a result of 932ms, the first phone we’ve encountered to limbo under the 1000ms barrier; in Geekbench, a popular iOS benchmarking tool, it scored 1674 to the iPhone 4S’s 627. Subjectively, it feels as smooth as every iPhone we’ve used, with the front-end, web pages and games all running as smoothly as expected. App launch times, already pretty snappy with the 4S, were even quicker on the iPhone 5, and the camera exhibited no shutter lag at all. Yet another performance boost is provided through the phone’s 4G LTE radio, with support for both Telstra and Optus’ nascent 4G networks.